My lack of planning has caused me a lot of problems during the writing of my book. One of the most difficult has been the name of my protagonist, which is also the name of this blog, and my Twitter and Facebook names. It was to be the name of the book – until I discovered a problem. Nobody knows how to pronounce it – and that includes me! Why did I pick on Byrhtnoth? Why not any of the other versions of his name? To be honest, I don’t really remember. Perhaps I thought it more “authentic” than the more common Britnoth. More likely, it was easier to grab a unique name for the blog etc. There are several different ways of writing the name – here is how it was written in the Anglo-Saxon Chronicle. The crossed d is an Old English letter called Eth and is the equivalent of th. Don’t ask me about the other letters! Byrhtnoth’s Memorial in Ely Chathedral. 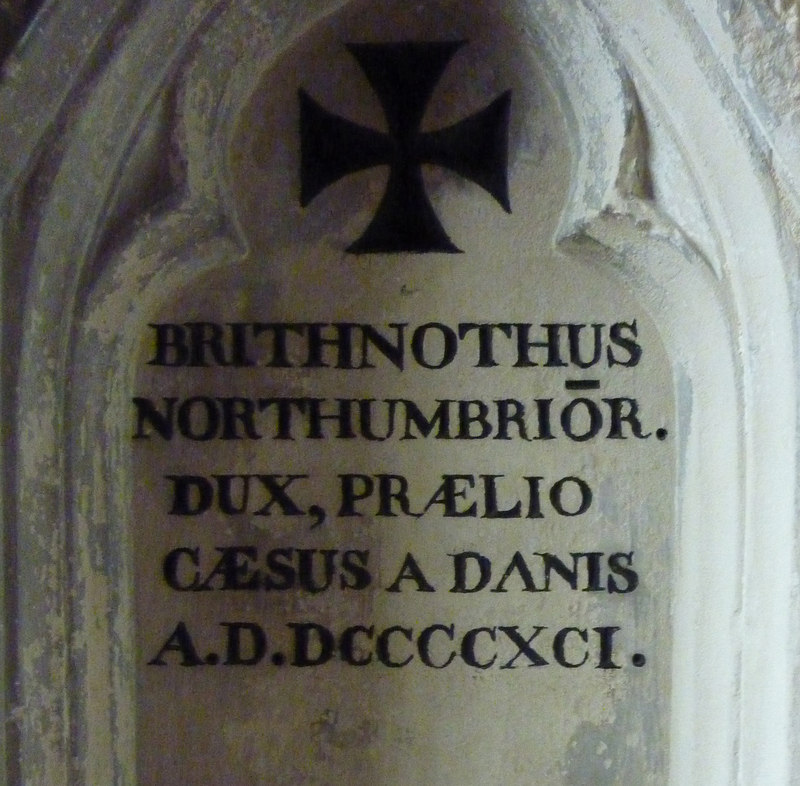 In Latin, inscribed on his memorial in Ely Cathedral it is Brithnothus. J. R. R. Tolkien wrote a play called The Homecoming of Beorhtnoth Beorhthelm’s Son, describing the aftermath of the Battle of Maldon, so we know that he thought it should be written Beorhtnoth. Britnoth, Byrhtnoth, Beorhtnoth and probably several others. Really, it doesn’t matter how you write it, as long as you know how to pronounce it. That is the problem. Since Britnoth seems to be the usual “modern” spelling, I assumed that was how it should be pronounced. So when anyone looked at my version, tried to read it and ask “How do you pronounce it?” I tell them Brit-noth. The name itself Byrhtnoth means something like bright courage, so should it be Brite-noth? At least this gave me a new name for the book – Bright something, and since it is about a search for a sword, it became Bright Sword (after checking that there wasn’t another book of that name – surprisingly there wasn’t.) 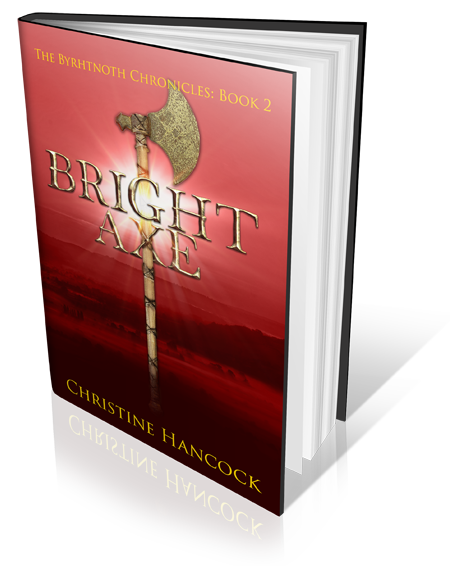 As the book became a series, I can use it for Bright Axe, Bright anything! While we’re here, have a look at that word “Bright”. If you hadn’t come across it before, probably at school singing “All things Bright and Beautiful” wouldn’t you stumble over how to pronounce it? Returning to my problem. My book is nearly published – less than a week to go! Sooner or later, I will be asked to read something from it. Can I get away with a piece that doesn’t mention my protagonist’s name? After all it is written in the first person. No, sooner or later I am going to have to face up to it, I will have to stand up and say “His name is – What? I have asked people I would have expected to know, they declined to commit. I can find nothing on the internet to tell me. But wait. The Battle of Maldon is a poem – a famous poem. There must be a recording of someone reading it. There are several. See here for a reading of Byrhtnoth’s speech. You can compare the Old English words with the modern version and hear the words. “Byrhtnoth” is the first word spoken , so you may have to replay it several times to hear how it is pronounced. Here, is another, more dramatic rendition, with subtitles so you can follow the words. I find it fascinating that in places the words are so similar, you can almost understand it, the next sentence is incomprehensible. What conclusion have I come to? I think the correct pronunciation should be something like Birrt-noth. This fits the old versions, but not the modern Britnoth. Why? Is it something to do with the Great Vowell Shift, when there were big changes in the pronunciation of the English language between 1350 and the 1600s and 1700s. See here for more information – I don’t know enough to explain it! What do I do now? Change my version of his name? Could you, having known someone intimately for five years, suddenly call them something different? Or do I stick with what I know and risk being told I’m wrong? Please, if anyone knows the correct version, tell me, before it’s too late! In other news, the cold I started last week didn’t develop into anything serious, but at least it gave me a bit of spare time to write. I managed 5,429 words last week. I will be blogging more this week, every day, up to publication day – 28th January. I will start later today with an interview with Byrhtnoth – however you pronounce it! I have come to a turning point. Well, not a turning point, just a place to stop and take stock of where I am going. This afternoon, I finished editing Book 2. Not sure which edit it is but I have gone through the first draft, checking for all those words I overuse. One of the worst was “look”. My characters look up, look down, they look at each other, they look at the sky, at the sea and their own hands. Well, they did, but not any more, and you know what? They don’t miss it at all (I did have to put back one or two, You can’t have a whole book without the word “look”.) Other words were Begin and Start, as in “he began to do something” – no he didn’t – he just did it! There are many others – I got rid of as many as possible. Then there were the adverbs – chopped. When I had done that, I printed out the whole thing, then locked myself away where no-one could hear and read it out loud! The things you discover when you do that! I returned to the computer with my, by now, colourful pages and made the amendments, picking up other errors on the way. I now have a readable manuscript of just over 91K words – just where I wanted to be. I have turned it into an ebook and sent it off to my Beta readers – yes, I have actually found someone to do that job. I was tempted to write another chapter – there are a few loose ends, but that can wait, for now. While going through all this, scenes for book 3 have been running through my mind. When the first line appeared, I knew I had to start writing again. I thought about taking part in NaNoWriMo, but didn’t allow myself to start until the editing was finished. It’s too late now, but I would never have managed 50k words in a month. I have too many other things to do. Bright Sword finally came to the end of its proofread/copyediting and is being printed. It is available for pre-order in all the usual outlets. It even has a review on Good Reads – four stars! So now I have given a big sigh (another overused word!) and prepare to start writing again. To celebrate this, and because it’s 5th November, here are some fireworks. 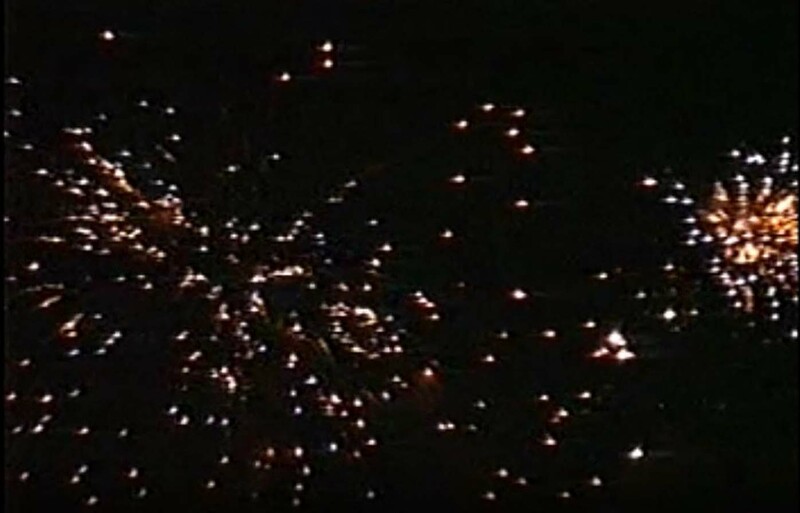 And if you are wondering what fireworks have to do with Byrhtnoth, this picture is from a film was taken on 10th August 1991 – the finale of the thousand-year anniversary of the Battle of Maldon.